It was announced as part of the Budget proposals that National Treasury may recharacterise the proceeds that are received by a shareholder that is a company in circumstances where it disposes of its shares through means of a share buyback as opposed to selling the shares outright to a third party. the sale of the shares to the company in which the shares are held through means of a specific repurchase of shares, which will result in an exempt dividend if the purchase price is not funded out of contributed tax capital. the purchase price is not funded out of share capital (contributed tax capital), but out of reserves, the purchase price is not only exempt in the hands of the seller company, but also not subject to dividends tax. In the Budget proposals it is indicated that one of the schemes that is used to avoid the tax consequences of share disposals “involves the company buying back the shares from the seller company and issuing new shares to the buyer”. Apart from the benefit that the seller company may derive, there is also an additional benefit to the extent that the purchaser subscribes for new shares in the company, the proceeds of which are used to fund the buyback of the shares. In particular, the share subscription will result in the contributed share capital of the company also being increased. 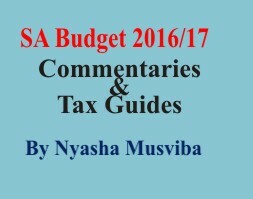 In the Budget proposals it is indicated that this type of transaction is in substance a share sale that should be subject to tax. The question arises whether the transactions will be recharacterised such that capital gains tax is payable even though it would, strictly speaking, be a dividend. Alternatively, it is possible that the dividend will no longer be exempt in the hands of the seller company of the shares, even though it is a company. It should be appreciated that these type of transactions are in any event not automatically without risk. There should always be a commercial rationale why the parties embark upon a share buyback as opposed to the sale of shares, for instance in circumstances where the purchaser does not have the relevant cash to pay for the purchase price for the shares in circumstances where the company in which the shares are held may have the relevant cash resources. Great care should thus be taken in implementing share buyback transactions where the parties rely upon the fact that the proceeds are exempt in the hands of the seller company over and above the fact that no dividends tax is payable.